A visit to the Japanese American National Museum encourages visitors to build personal connections, empathy, and compassion. Our tours complement classroom learning and share the richness of the Japanese American experience with students and adults, including native Japanese speakers. Please check the Group Visit Offerings listed on this page. All group visits must be booked at least three weeks in advance. Unless otherwise noted, school group visits begin at 10 a.m., last between 1.5–2 hours, and can accommodate up to 120 students. Other important information about planning your group visit can be found by clicking on the links at the right, including how to apply for free admission and transportation grants for school groups. Once you decide which tour option your school group would prefer, check our calendar of available dates and then click below to book. If you have any questions, please email us at groupvisits@janm.org. We are happy to help you! Available 10 a.m. start time. 120 students maximum. Available Tue & Thurs only. This interactive tour of the exhibition Common Ground: The Heart of Community is led by our volunteer docents and focuses on community, culture, and traditions by exploring the Japanese American immigration experience. The word origami comes from the Japanese words for folding (ori) and paper (kami). Students will make their own origami art pieces while learning about the history of the craft and how it became an international art form. Students will make a house to symbolize home and community. Younger students will make a kori basket similar to those used by Japanese immigrants to carry their belongings, while older students will work on more complex projects. Japanese immigrants first brought the art of taiko drumming to the United States in the early twentieth century. In recent decades, the art form has absorbed influences from other world cultures to produce a uniquely Japanese American drumming style. In this interactive performance, students will learn basic taiko rhythms, try their hands at a call-and-response session, and learn how composers build complex pieces from simple beats. A storyteller will captivate students with an interactive, illustrated story. Depending on the age of the audience, stories will range from traditional Japanese folktales to accounts of the Japanese American experience during World War II. Available 10 a.m. start time. 120 students maximum. Available Tue-Fri. The word origami comes from the Japanese words for folding (ori) and paper (kami). Students will make their own origami art pieces while learning about the history of the craft and how it became an international art form. Students will make a house to symbolize home and community. Younger students will make a kori basket similar to those used by Japanese immigrants to carry their belongings, while older students will work on more complex projects. 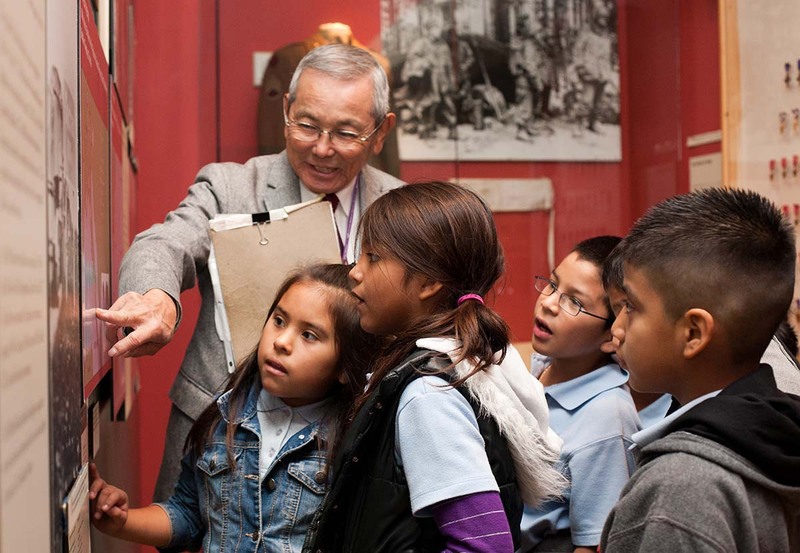 This facilitated tour provides young students the opportunity to explore the exhibition Common Ground: The Heart of Community while thinking critically about and discussing specific artifacts and images within the context of Japanese American history. The word origami comes from the Japanese words for folding (ori) and paper (kami). Students will make their own origami art pieces while learning about the history of the craft and how it became an international art form. Younger students will make a kori basket similar to those used by Japanese immigrants to carry their belongings, while older students will work on more complex projects. This session provides students with a rare opportunity for hands-on time with artifacts from JANM’s education collection. Through analysis and interpretation, students will gain an appreciation for the rich histories that objects hold. Available 10 a.m. start time. 120 students maximum. Available Tue only. This informative tour of the exhibition Common Ground: The Heart of Community is led by our volunteer docents, some of whom can share firsthand knowledge of the World War II incarceration period. When reserving this tour, please advise the education staff in advance of what your students are studying; the docents can then adjust the tour to highlight specific areas of interest. This tour of the exhibition Common Ground: The Heart of Community provides a learning experience through analysis and interpretation of specific artifacts and images within the context of Japanese American history. After spending time in the galleries, a facilitated activity and group dialogue will help students connect the Japanese American story with the larger American experience. The word origami comes from the Japanese words for folding (ori) and paper (kami). Students will make their own origami art pieces while learning about the history of the craft and how it became an international art form. One of two films described will be shown. Through rare historic footage, photographs, and the personal recollections of former inmates, Remembering Manzanar vividly evokes the experiences of the 10,000 Japanese Americans who were incarcerated in this remote desert facility during World War II. This documentary was created by the National Park Service for use at Manzanar National Historic Site. 9066 to 9/11: America’s Concentration Camps, Then… and Now? This film compares the treatment of Arab and Muslim Americans after the September 11, 2001, terrorist attacks with the treatment of Japanese Americans after the 1941 bombing of Pearl Harbor. Revealing striking similarities, 9066 to 9/11 serves as a primer on the ongoing relevance of the Japanese American incarceration experience. Available 10 a.m. start time. 35 students maximum. Available Tue-Fri.
Those who have struggled for freedom and equality have extended democracy’s reach for all. Fighting for Democracy: Who is the “We” in “We, the People”? is an experimental exhibition based on these fundamental principles. It features seven real people and traces their stories throughout the pre-World War II, World War II, and post-war periods as examples of the millions of Americans whose lives were affected by the war and how each sought equal rights for their families and communities. This exhibition offers integrated educational activities designed to challenge conventional assumptions about democracy in the United States, facilitate critical thinking, activate youth-to-youth dialogue, and inspire participation. You may download the exhibition resource guide here. Available 10 a.m. start time. 70 students maximum. Available Tue-Fri. This visit is a collaboration between JANM and our neighboring institution, the Go For Broke National Education Center (GFBNEC). Students will experience two interpretive exhibitions: JANM’s Fighting for Democracy and GFBNEC’s The Defining Courage Experience. Both of these exhibitions encourage critical thinking and participation as students explore civil rights through the examination of history and present day relevance. This visit is best suited for students with a basic knowledge about the Japanese American World War II experience. Available 10 a.m. start time. 120 students maximum. Available Tue & Wed only. Available 10 a.m. start time. 60 students maximum. Available Tue-Fri. This tour is for motivated learners to independently explore the exhibition Common Ground: The Heart of Community and then discuss how the Japanese American experience relates to the themes of civil rights and democracy. This tour option requires active involvement of teachers and chaperones. Upon request, a program outline will be provided to teachers interested in finding out more. Guided and self-guided tours are available for groups of ten or more of our exhibition Common Ground: The Heart of Community. Guided tours must be booked at least three weeks in advance and are pending docent availability. Guided and self-guided tours in Japanese are available for groups of ten or more of our exhibition Common Ground: The Heart of Community. Guided tours must be booked at least three weeks in advance and are pending docent availability. Self-guided groups are welcome, although we encourage all groups to take advantage of our guided tours. If you are planning a self-guided visit to the JANM, reservations are requested to ensure a better experience for your group and any other guests who may be in the galleries at the same time. Some temporary exhibitions may have age restrictions, additional chaperone requirements, and/or be off-limits to self-guided groups. Self-guided school groups do not qualify for the Free Admission Grant or school group discount rates. It is especially important that self-guided groups have the appropriate number of chaperones (one per 10 students). Unaccompanied school groups can become disruptive; therefore, self-guided school groups who arrive at the museum without the correct number of chaperones cannot be admitted. This program is designed for students who have some previous knowledge of the Japanese American World War II experience. From their classrooms, students will have an opportunity to conduct oral history interviews with one of our volunteers through digital technology. The volunteer will share rich narratives that make our history more diverse and fosters personal connections across generations that are difficult to replicate in a textbook. Media requirements and pre-interview preparation required. Please contact groupvisits@janm.org or 213.830.5601 for reservations or more information.